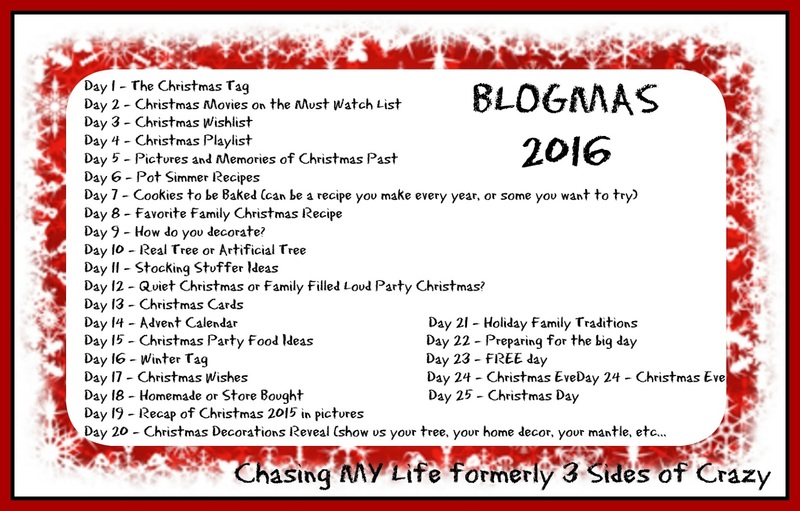 Sandra at Diary of a Stay at Home Mom ran a meme BLOGMAS 2014. I did it in 2015 and this year I'm doing it all again to remind me that life is ALWAYS worth the effort. This is a really hard category for me. I LOVE Christmas! There is nothing about this season I don't like short of maybe crowds of rude people and Black Friday. Being a military family on a tight budget I've always started shopping early to work everything we want to do into our tight budget. If I had to pick just one though, it would be putting up the tree as a family while eating leftover turkey (from Thanksgiving) sandwiches. We usually put our tree up just after Thanksgiving and leave it until Kings Day, the Epiphany on January 6th. For that reason we like to go cut our own tree so it's fresh and last the entire time. I use an apple cider/sugar mix that keeps the sap from forming on the cut area and keep the water cool and full. When I was a kid we did a BIG family get together with a buffet of food and opening our family presents on Christmas Eve. I just saw a few of my cousins and we were reminiscing about some of those holidays and LOL how horrible our wardrobes were back then. 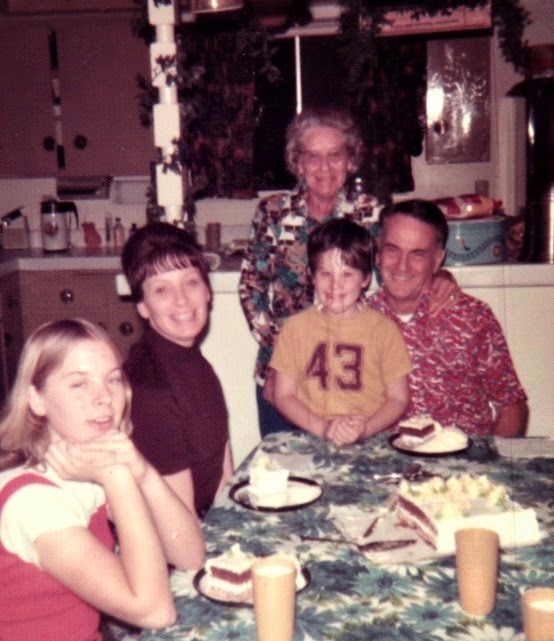 The first picture here is especially special because it is those grandparent's house that we are rehabbing now. Thankfully, I'm not in the bottom picture because I remember what I was wearing! 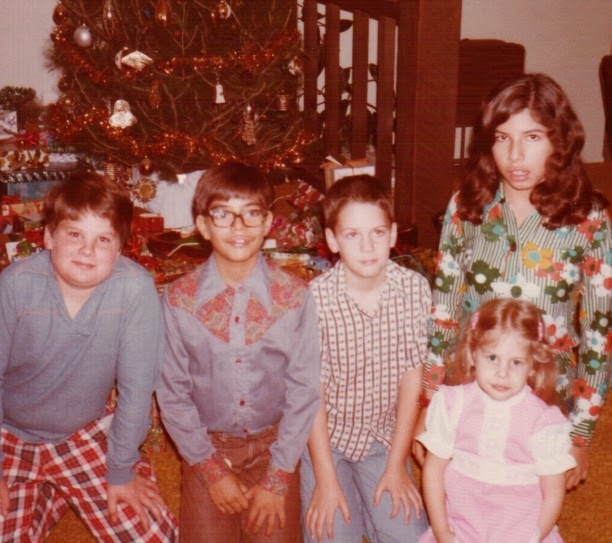 But I love my brother's plaid pants and Monica's floral blouse. If you don't hear from me for a few days I'm Sure it's because one them found me LOL. Then on Christmas Day we did Christmas morning and "Santa" with just the immediate family and then we would do a BIG turkey with all the trimmings including my dad's stuffing and giblet gravy with all the family as well as extended family, which included crazy Aunt Louise and Uncle Herb, but I'll tell you more about them on the 10th. I replicated dad's stuffing recipe a few years ago (Oatnut Sourdough Herb Dressing) and that is now a MUST for the Christmas meal whatever the meat is and I'll tell you more about that on the 10th as well. HI Tamy! I love reading about your memories. And I LOVE the pics!! Lol I think it's especially cool that the top photo is of the house you're rehabbing. That's awesome! I love your new background too. LOL I had this post up and then Sandra and I talked this morning - great minds and all. I was going to go make sure you knew it was a BLOGMAS year.